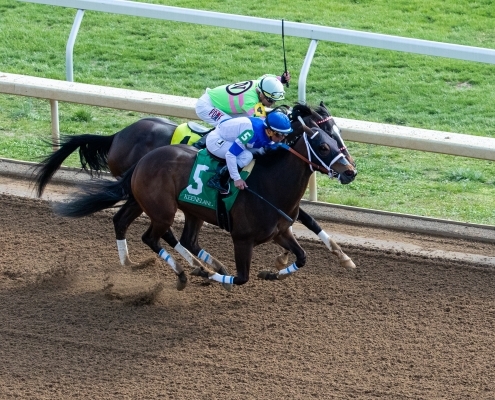 A trip from her Southern California base paid dividends April 6 for Spiced Perfection as she prevailed in a stretch duel to win the $300,000 Madison Stakes (G1) by a neck over a game Amy’s Challenge at Keeneland. Spiced Perfection also won the La Brea Stakes (G1) Dec. 26 at Santa Anita Park, which, like the Madison, was contested at seven furlongs. Winning trainer Peter Miller is thrilled with the 4-year-old Smiling Tiger filly, who races for Pantofel Stable, Wachtel Stable, and Peter Deutsch and entered off a close runner-up finish in the Barbara Fritchie Stakes (G3) Feb. 16 at Laurel Park. “To win for these owners with this filly, it means a lot to me—and to win here at Keeneland,” Miller said. “(It was a) great ride by Javier, and I’m happy for the whole team. She ran great, she deserved it. She’s got a huge heart. She’s not a big filly. She’s not impressive to look at, but she’s impressive to watch run. Spiced Perfection and jockey Javier Castellano tracked Amy’s Challenge as the latter worked her way toward the rail after starting from post 4. Those two cruised through a quarter-mile in :22.56 before opening on their other seven rivals through a half-mile in :45.53. It proved a two-horse race, with Spiced Perfection seizing the lead in midstretch and holding off a re-rally attempt by Amy’s Challenge and jockey Alex Canchari. Spiced Perfection completed the seven-furlong test in 1:23.49 on a fast track. It marked a third straight day for Castellano with at least one stakes win at Keeneland. He took the opening day Palisades Turf Sprint Stakes aboard Bulletin and the April 5 Kentucky Utilities Transylvania Stakes (G3T) on Avie’s Flatter. He also won three of the first six races Saturday at Keeneland. Spiced Perfection returned $11 to win, $4.60 to place, and $3.20 to show. Amy’s Challenge paid $4 and $3.20 for the minor awards. Late Night Pow Wow earned her first grade 1 placing by finishing third, paying $2.80 to show. Champion female sprinter and favorite Shamrock Rose never threatened the top two and finished fifth. Cathedral Reader broke down near the quarter pole. Kentucky Horse Racing Commission chief veterinarian Bruce Howard said the filly was euthanized following the catastrophic injury to her right front leg. Bred in California by Premier Thoroughbreds out of the Pleasantly Perfect mare Perfect Feat, Spiced Perfection was purchased by Michael Faber’s Dare to Dream Stables from Checkmate Thoroughbreds’ consignment to the 2017 Barretts March 2-Year-Olds in Training Sale. Before the Barbara Fritchie, she was sold privately to her current owners.